Hunting wild game with a bow, from firsthand experience, requires closer proximity than hunting with a firearm and this necessitates the utmost stealth. Mankind hunted wild game with a bow and arrow for thousands of years and there has been a steady positive progression in tactics and technology. From better bow material, compounding the potential energy in a draw to fiber optic sights, hunters even wear cutting edge clothing that can block most odor molecules and minimize detection. In addition to all of the modern technological advances in bow hunting, the folks at Human Energy Concealment Systems, LLC (HECS) have developed clothing that essentially eliminates animals’ sixth sense of detection. Sound too good to be true? The company has years of research and supporting studies to support and validate their clothing material’s effectiveness. This is how it works. Scientists have known for years that organisms, including a single bow hunter in the field, emit electromagnetic (EM) energy roughly in the infrared (IR) range. Now, try your very best to remember your high school or college physics lessons about how this EM energy in this range has a slightly longer wavelength the the range of visible light. We all have seen action movies and television shows where humans give off a heat signature and this is detectable by IR sensitive equipment. That’s not all. Humans and other animals conduct electricity. Have you ever touched an electric fence or shocked someone in the winter due to all that built up static electricity? The human body naturally has electricity flowing through it; this is principle behind EEG’s and EKG’s. Contracting a muscle, such as drawing a bow, emits EM energy, and when a hunter watches a trophy animal bound away, safely out of range, they are sure animals have a sixth sense and can detect a human through some unknown way. It is already established in the scientific community that birds, for example, possess EM detection abilities and use these during migration. Sharks have acted less aggressive when divers, in very close proximity, use meshed clothing that phases out most EM energy emitting from their bodies. This is what HECS has done. They have developed a carbon mesh material that encases the human body and minimizes detectable EM energy emission. This suit is poised to revolutionize bow hunting and the sportsman’s goal of remaining “invisible” is now within reach. Click to save up to 15% off the Excalibur Axiom 6845 in 2017! Rated 4.9 out of 5 from over 99 reviews! My experience with the Starfire was not that positive really. I was very loud when shot, it had a lot of vibration, and I mean a LOT! I tell people it reminded me of hitting a flag pole with a aluminum baseball bat, in December! So I had a few criteria when I decided to try and shoot a crossbow again. First, I wanted a reliable unit. I didn’t plan on breaking the bank, but I felt like I should be able to buy a reliable unit for a fair price. I certainly wasn’t going to buy a piece of junk! 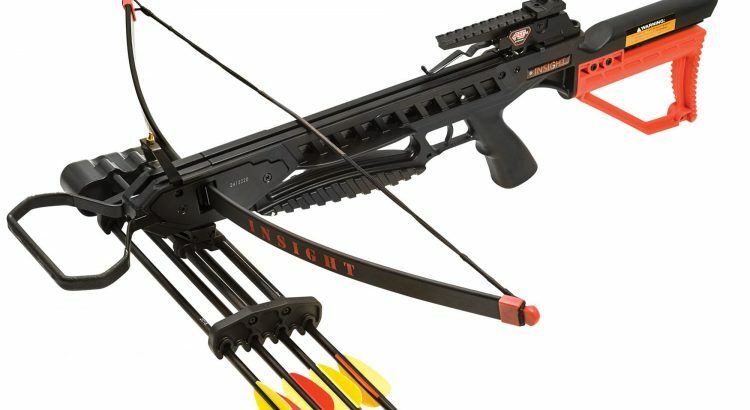 I wanted a crossbow that had accessories and a good availability of parts should I need them. Second, the crossbow had to be very accurate. Col. Townsend Whelen once said that only accurate guns are interesting and that’s the way I feel about bows. If a crossbow isn’t accurate, I have no need for it. Third, I wanted one with the reputation as being a reliable crossbow from a reputable company. I had looked over a bunch of outdoor catalogs, read all I could about crossbows at the online hunting forums as well as finding other literature on crossbows. My choices came down to 4 crossbows. They were from Barnett, Ten Point, Parker and Excalibur. After shooting each of my choices, I happily bought the Excalibur Axiom Crossbow and I couldn’t be happier! 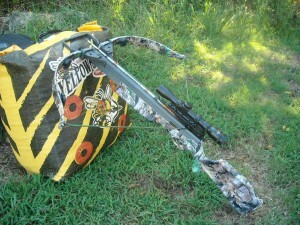 To say the least, this is a smooth shooting, hard hitting crossbow that is pure joy to shoot! For those that do not know a lot about Crossbows, the Excalibur Axiom crossbow is a recurve crossbow pulling 175 pounds. From what I’m told on the Excalibur forums, it’s basically a Excalibur Phoenix without the dissipator bars on the front of the limbs and has a different Camo job. What was even better was the price! The Axiom kit comes with a scope that is calibrated to the speed that the Axiom shoots (Excalibur says 305 fps with a 350 grain arrow and a Flemish Dyna Flight String), Excel String, Scope Mounts and Rings , Excalibur 4 Arrow Quiver, Quiver bracket, 4 Firebolts and 150 grain field points. When my Axiom crossbow arrived in the mail, it took maybe 30 minutes to put the limbs on the stock, install the scope mounts and rings on the Scope and then onto the rail. It took longer to watch the included DVD than it did to get the Axiom put together and be ready to shoot! When I went to sight it in, I was in for another surprise. My first arrow hit about 8 inches high and about 6 inches to the left. I adjusted the scope and fired another arrow. It hit about 1 1/2″ to the right of the aiming point. Another adjustment and I shot another arrow. Bullseye! 3 arrows shot to sight this shooting machine in at 20 yards! 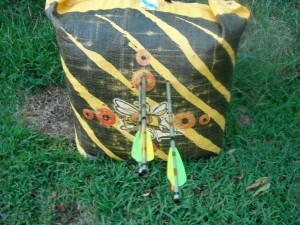 Next, I collected my arrows and shot a 4 arrow group at 20 yards. This proved my inexperience with Excalibur crossbows. You don’t shoot groups with them unless you’re willing to lose a few crossbow arrows because they are accurate! Once I knew it was sighted in at 20 yards, I backed up to 30 yards. 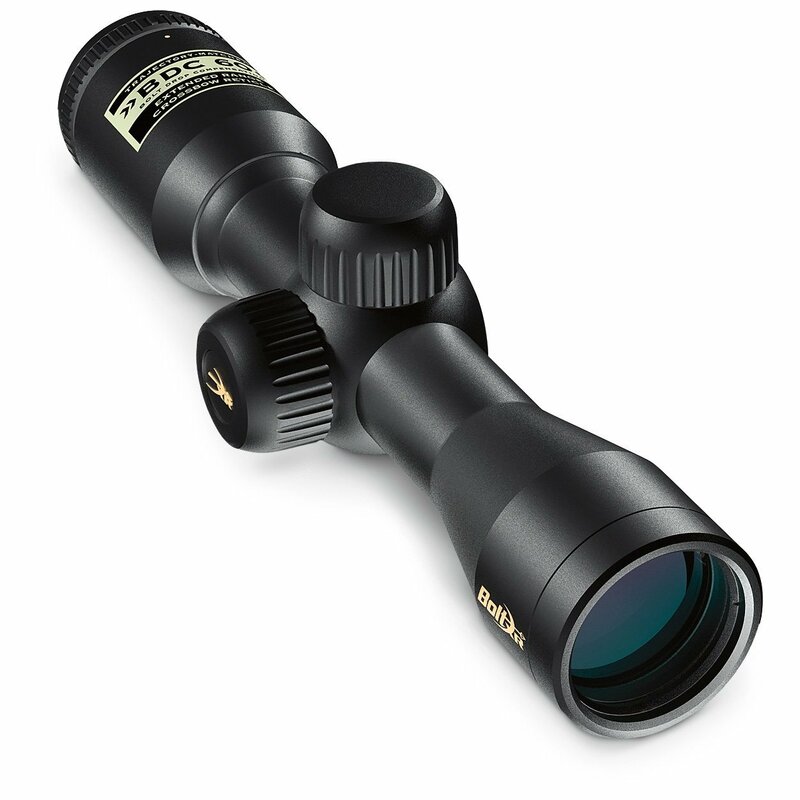 The Axiom scope is compensated out to 50 yards for the speed that the Axiom shoots. 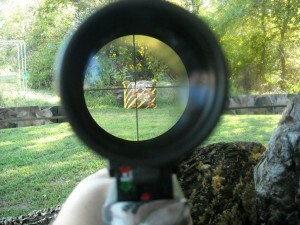 It has small chevrons below the crosshairs for the ranges of 30, 40 and 50 yards. Another thing besides the accuracy of this Crossbow is how accurate the scope was! I backed all the way out to 50 yards and using the 50 yard chevron (which is right where the crosshairs go from thin to thick), I not only hit the target, I had about a 3″ group! This is from someone who hadn’t shot a crossbow in about 15 years! 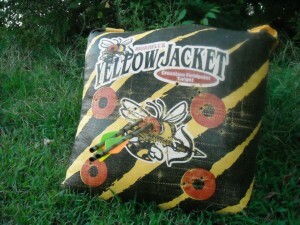 I eventually started damaging the nocks of my crossbow arrows when shooting for groups so I had to stop and just started choosing other aiming points on the bag. I now have about 7 damaged arrows including one Robin Hood (splitting one arrow in the target with another arrow) that happened when shooting at 40 yards! Needless to say, my experience with the Axiom is day and night difference from shooting the old PSE Starfire. Of course, it was a pretty big difference from shooting the other crossbows, that’s why I ended up with it! One thing that I wasn’t totally happy with the Axiom is that the top of the stock is a little low for me. I ended up buying one of the Excalibur add-on cheek pieces and it has solved the problem. Now shooting through the scope is more fun! 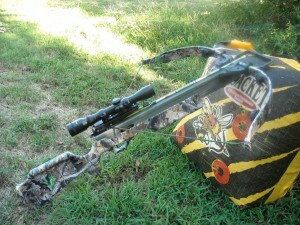 I also added the Simms silencing package for Crossbows. This includes 2 limb silencers, a silencer for the arrow retainer and string leeches. I tried several times to keep the string leeches on but it wasn’t meant to be. After about 5 shots the Axiom would throw them off. This package from Simms really quieted the bow down. I later bought the Simms wrap and wrapped it around the stirrup to remove any sound it made during the shot. This also helped! Before hunting season, I’ll add cat whiskers to the string. It’s a little different technique than putting cat whiskers on a compound bow, so you need to watch the proper way. With the Axiom’s 175 pound pull and speeds up to 305 fps, I honestly don’t think there is an animal Walking on the North American continent you couldn’t put down at ranges under 40 yards. The bow shoots that hard and it shoots fast! I enjoy shooting the Axiom so much, that I plan on buying another one next year! Probably go up in weight a little, but then again my Wife, who is a non-hunter, even enjoys shooting my Axiom so I might just buy her one of those Pink Vixen II’s! If you’re looking for a hunting crossbow that is reliable and one you can work on in the field, like replacing the string should you cut it with a broadhead, then look at Excalibur crossbows. Give the Excalibur Axiom Crossbow a look over if you wanting to buy a kit that has everything you need to get into the fun of crossbow hunting! See the Pictures below for some pics from my casual shooting with the Axiom. Needless to say, I don’t aim at the same dots any longer. It will get expensive really quick when you start replacing crossbow arrows! Many of you know I love to hunt deer with modern firearms and blackpowder guns. What you may not know is that I love to bow hunt just as much. In fact, I can honestly say that my gun hunting improved 100% when I took up bowhunting. I’m not sure if it was the extra time in the field or learning how to position my stands to intercept deer at bow range, but my buck kills certainly increased after my Dad bought me that my first bow, a Bear Polar LTD 4 wheel bow. Yeah, it has been that long! Over the years, Bear bows have been know to be front runners in design and innovations. At some point though, they fell behind in both IMHO. Seems like in the last decade or so Bear bows were known as “starter” bows or “economical” bows. In my opinion, they just seemed to always be lagging behind the trendsetters. I think I can safely say those days are over. I stopped by my local Bass Pro Shops store over the weekend to shoot a couple bows for reviews here. Now I’m normally suspicious when one company seems to get another company to “endorse” its products such as Bear Archery has done with Primos. However, since I’ve used products from both companies for many years with excellent results, that suspicious feeling never materialized. If it did, it quickly left when I started shooting “The Truth”! This bow is nothing short of amazing. I do have to hand it to the Primos Team and Bear Archery. This bow is Sweeet! First off, it’s lightweight with an axle to axle length of just 33″. Now until recent years, I’ve been an old school finger shooter and the short axle to axle length bows would kill my fingers. Over the last few years, I’ve shot more and more with a release and I find that I’m getting more consistent over time with a release. The Truth is also feather light weighing in at 4.2 lbs. Man, the old Bear compound bows I used to own felt like they weighed 10 lbs. I can’t get over how light today’s bows are. Another thing I found great about this bow is that it felt good in my hands. Not all these little bows do, but The Truth felt like it was made especially to fit my hands, I like that! Even though I have a 15 year old Darton bow I still hunt with, I’ve shot many of the latest and greatest bows over the years thanks to hanging around Archery Shops and friends who have to have new bows every other year! I can say without batting an eye that The Truthis as smooth as any modern bow I’ve shot and I’ve shot all the name brand bows on the market today. I loved how smooth this bow is when coming to full draw. Long gone are the days of the herky jerky grunt and draw! The 80% let off reduces the poundage your holding at full draw to practically nothing. The older I get the less bow weight I use. I’m now shooting a 63# bow. The fine folks at Bass Pro said the bow I was shooting was set at 65 lbs, but it felt a lot less. If I hadn’t seen the scales myself, I would have thought they were pulling my leg. The most important thing about a bow to me is how quiet it shoots. You can have all the speed you want. Give me a quiet bow any day over a fast and noisy bow. I can’t tell you how many deer are dead today because the stuck (no pun intended) around and let me get off another shot after missing with my first one. You don’t get those kinds of opportunity’s with noisy bows. And a lot of the bows on the market today are noisy. Sure, they’re fast, but they’re also noisy. By the time you add stabilizers and shock absorbers to the bow to make it semi-quiet, the weight is back up there around 6 to 8 lbs. What’s the use of taking advantage of the new lighter bows if you have to pack so much junk on them to make them quiet? I’m glad to report that The Truth was a very quiet shooting bow. Even when shooting indoors, it was quite a surprise to hear how quiet it was. Shot after shot, I begin to think this would be my new hunting bow! The next surprise I received was how fast the bow was. Now I’ve never been a speed freak, believing instead that a slow, quiet and accurate arrow makes more kills than a noisy, fast and erratic arrow. In my experience, there were few fast, quiet and accurate bows! The Truth is the first bow in a long time that I felt was fast, accurate and quiet. I didn’t have to worry about any of that with The Truth. Once I had the pin sighted in for me, it was a simple matter or producing very tight groups with this bow. Overall I fell in love with the bow. I want one and I have to figure out how to tell the Wife that I’ll be purchasing a new toy! Which brings me to my next surprise. The price! In my opinion, this bow is priced a lot less than many of the high end bows that can’t outshoot The Truth. I think many consumers get into the “if the price is high, the quality must be high also” syndrome. I also think many fall for a high price so they can brag about how much their bow cost. Because I’ve shot many of their bows and that’s about the only thing you can brag about! The Truth comes with a very reasonable price tag. 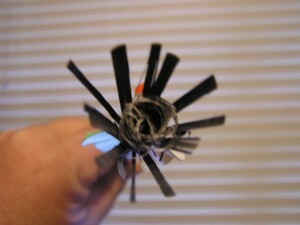 It’s priced a hundred or more dollars less than many other bows that come with this many features. If you’re in the market for a new bow, give The Truth a try at your local archery shop or at a Bass Pro Shop near you. You won’t be sorry. Oklahoma deer hunting has come a long ways since I grew up there. When I was a boy, there were only a few counties in the state that were designated as “Shotgun Only” and I lived in one of them (in fact, it may have been the ONLY county designated as Shotgun Only). I never did hear a good reason why that was. As a boy, I lived the good life. We lived on 45 rural acres with access to literally thousands more acres and many of those bordered a river. I could travel just about anywhere I wanted as long as my legs held out. And during the fall, I traveled! I trapped, hunted squirrels, rabbits, ducks, quail and dove plus I fished every chance I got. It was a rare event to see a deer when I was growing up. Even seeing a fresh deer track was something to talk about at school. Over the years, the Whitetail Deer herd has grown tremendously in Oklahoma. I’m fortunate enough today to hunt the same areas I wandered as a boy and Deer numbers are plentiful in all those same areas where they were scarce only 20 years ago. In fact, I’ve taken 2 of my best Whitetail bucks in that area. Talk about turnaround! Today, I don’t know of a County that doesn’t hold a good deer population in Oklahoma. From the Panhandle to the Southeastern tip of the state, Oklahoma has deer in both numbers and size. Sadly, as in many other parts of the country, private land is being leased up by corporations and commercial hunting interests at an alarming rate. Oklahoma deer leases fetch a pretty penny these days and it’s hard for a Landowner to turn the extra money down. The days of you stopping by and asking a Landowner for permission to hunt are going away. If bagging a deer is your goal, Oklahoma has many good Wildlife Management Areas for you to go. Click here for a map showing the locations and descriptions of Wildlife Management Areas in Oklahoma. Some of the most popular places to tag a deer on public lands are: Three Rivers WMA, Quachita, Cherokee, Okmulgee, Canton, Cooper, Spavinaw, Eufaula. Some of these Public WMA’s have flooded timber so you might want to think about hunting flooded timber during the regular gun season if the regulations for that WMA allow it. Some of these areas have special regulations concerning deer hunting so be sure to check the regulations before heading out. The ODWC has what they call “Controlled Hunts” each year on a select number of tightly managed areas. Most are public land such as WMA’s or NWR’s. However, some are private lands such as the McAlester Army Ammunition Plant. Here’s a run down of some of the top Trophy spots in Oklahoma. McAlester AAP is probably the best place for a public land hunter to see trophy bucks in Oklahoma. It’s a controlled hunt but there is also another catch…the controlled hunt is traditional archery only. No compounds allowed. No releases allowed! No sights allowed! I’ve been fortunate to be drawn into “Big Mac” 5 times over the years. 3 times back when you could actually use a compound bow. Every time I seen at least 3 P&Y bucks. Unfortunately the last hunt I had one hang up at 50 yards but just wouldn’t come any closer. It’s tough hunt, there’s only 1 afternoon of pre-scouting. But for those that do their research and sharpen their Traditional Archery skills, it can pay off with a nice P&Y buck. I’m amazed at how far people have traveled to hunt here. Each time I was drawn, I camped onsite and have met people as far away as New York. IMHO, the best time to be drawn into a hunt at McAlester is the first two weekend of November, with the weekend around Nov. 12th being the best. Salt Plains NWRis in Northwestern part of the state. The Salt Plains offers Archer, Muzzleloading and Gun hunts under controlled access and dates. Every year, there are some huge monsters taken in the Refuge. The land around the NWR is agriculture and offers deer in the area plenty of grub to grow big. There are also food plots inside the NWR should a big buck want to avoid the hunting pressure around the Refuge boundaries. Being a NWR, many areas can be pre-scouted before the Controlled Hunts. Cookson WMAis in the Northeastern part of the State. I consider Cookson a sleeper for big bucks. 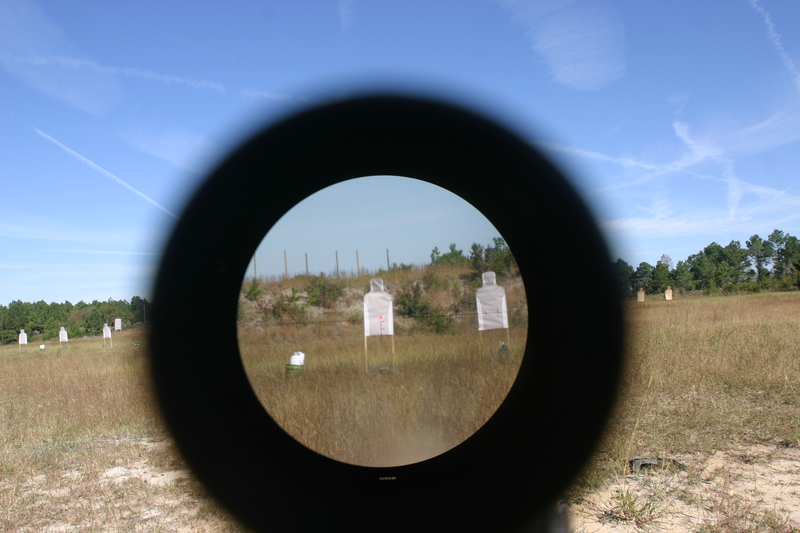 Cookson WMA has a Muzzleloading and Gun Controlled hunt. The WMA is open in the late season to Archery hunters. Cookson WMA is a tough hunt. There are steep brushy hills. In fact, Cookson WMA has it’s own resident Elk herd and the steep hills in Cookson WMA suit them just fine. As with any public land controlled hunt, your best bet is the first few weeks of November. One of the widest bucks I’ve even seen I saw while leaving Cookson WMA on a Controlled Hunt. I had just pulled out on the highway from checking my own buck in and saw a hunter parked at a access road and turned to see him just walking in. I looked back down the road as I went by and a huge 8 point walked out. It looked like his antlers grew straight out to the sides of his heads. Funny thing was that buck was only about 75 yards from the Hunter I saw walking in, albeit on the opposite side of the road. McGee Creekis located in the in the South-Southcentral part of the state. Like Cookson, McGee Creek is a tough hunt. The terrain is steep so be prepared for some leg work. This hunt is not for the overweight, out of shape hunters! McGee Creek has both Muzzleloading and Gun controlled hunts. Pre-hunt scouting is essential due in part to the rough terrain. Hunter success is rather high and many good bucks come off the WMA each year. There are plenty of food plots planted on McGee Creek, however as with any Public hunting area, many hunters will be parked on these. For success, get back off the beaten path and find your own secluded spot. McGee creek consist of Oak-Pine forest that is typical for the Southeastern part of Oklahoma. While many Oklahoma deer hunters think of the Wichita Mountains NWR as a Elk hunt, it’s a little secret among some of us that the WMWR offers some good hunting for big bucks. The Controlled Hunt for the Wichita Mountains NWR is Gun only. This too is a tough hunt. There is a resident Elk herd living in the Mountains, so don’t panic when you come up on a rub as big as your arm and 4 feet up the tree! Scouting is the name of the Game here. You’ll also do good with contacting the Biologist and others who are on the Refuge day after day. Pick their brains for the areas where they’re seeing some good deer and then do your foot work. Need More Choices for Hunting Deer in Oklahoma? 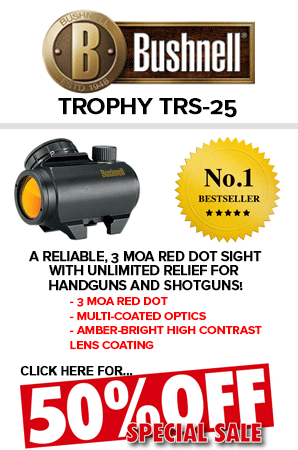 There are many more WMA’s in Oklahoma to choose from. Truth be know, each year everyone one of them produces a good buck I’m betting. Of course, your chance of tagging one increases with less pressure. Before heading out, read the Oklahoma deer huntingregulations to see what the bag limits are and if there are any restrictions to the piece of Public land you’ll be choosing. Also, the ODWC has a digital map on their site where you can view aerial photo’s and topo gradient for many of your favorite WMA’s. It’s a great research tool. You can find the regulations and more informatio about deer hunting in Oklahoma by clicking here.